Due to decrease of users associated with the changes in internet environment, we will be closing Secure Hosting Service as of May 31, 2019. Accordingly, we have stopped accepting new application for the service as of November 30, 2018. We thank you for your interest in the service, and those members who have been using the service. Asahi Net's Secure Hosting service consists of several virtual operating systems (OS) running on one server, and offers features and flexibility you'd expect from a dedicated server, at a reasonable price. Other than the hardware and network, each virtual OS is completely independent; resources such as the CPU, memory and network traffic are allocated evenly to each virtual OS. As a result, if a virtual OS on the same server has a very heavy loading the resources available to the other virtual OSs are guaranteed and therefore those virtual OSs will not be affected. Asahi Net's Secure Hosting service suits those who have requirements such as "need root authority but don't need high loadings", "want to use a dedicated server but want to control implementation and operation costs", or "want a hosting service with high flexibility". Detailed information about the service can be found in the application document. The Linux distribution CentOS5 is an edited and re-compiled version of Red Hat Enterprise Linux's open source code based on its General Public License (GPL). The user community offers security updates, etc. * In addition to the above charges, Asahi Net will also charge for Business service handling fees, Internet connection Course charges, etc. *1. The Initial charge is made in the month the Secure Hosting service is configured for the user. *2. Monthly charges will start from the month after the Secure Hosting service is configured for the user. Application forms are available in PDF format. 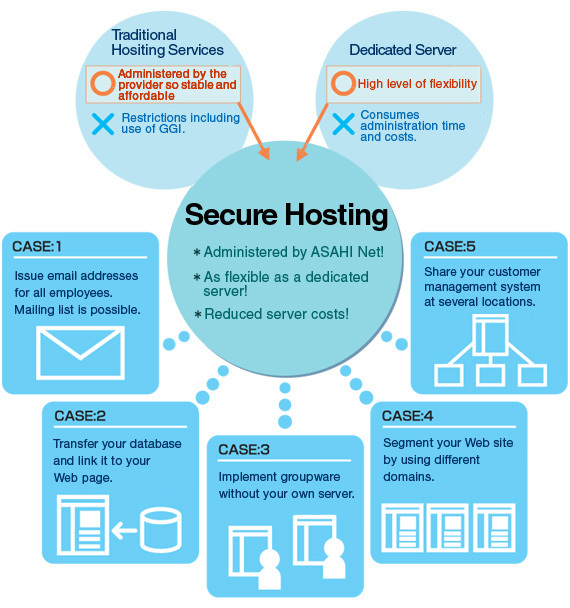 It is possible to apply for the Secure Hosting service after becoming an Asahi Net member. Please refer to the link page for how to use PDF files.